Wooden Bluenose Limited Model Sailboat 25"
Wooden Nautical Sailer Model Sailboat Decoration 17"
Wooden Malibu Decorative Sailing Model Ship 15"
Wooden Patriotic Sailer Model Sailboat Decoration 17"
The fine detailing and precise craftsmanship of these Limited Edition scale replica yacht models of the famous Canadian schooner Bluenose are sure to please discriminating sailing boat aficionados and racing yacht enthusiasts alike. Adding a touch of classic elegance to the room they grace while emanating the winning spirit of their namesake, these detailed scale yacht models are the perfect size for display upon any table, shelf or desk. 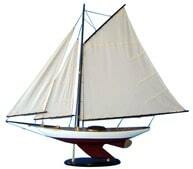 Wooden Bluenose Limited Model Sailboat 50"
Bluenose was a Canadian schooner from Nova Scotia, a celebrated racing ship (and hard-working fishing vessel) and a symbol of the province. The name "bluenose" originated as a nick-name for Nova Scotians. Designed by William Roué and built by Smith and Rhuland, Bluenose was launched at Lunenburg, Nova Scotia on March 26, 1921, as a racing ship and fishing vessel. This was in response to the defeat of the Nova Scotian Fishing Schooner Delawana by the Gloucester fishing schooner Esperanto in 1920. That race was sponsored by the Halifax Herald newspaper. After a season fishing on the Grand Banks, Bluenose defeated Elsie (out of Gloucester, Massachusetts), returning the trophy to Nova Scotia. During the next 17 years of racing, no challenger, American or Canadian, could wrest the International Fishermen's Trophy from her. It is notable that she was no mere racing ship, but also a general fishing craft that was worked hard throughout her lifetime. She fished scallops and other kinds of sea-food, and at least once won competitions for largest catches of the season and similar awards. Fishing schooners became obsolete after World War II, and despite efforts to keep her in Nova Scotia, the undefeated Bluenose was sold to work as a freighter in the West Indies. She foundered on a Haitian reef on January 28, 1946. Bluenose and her captain, Angus Walters, were inducted into the Canadian Sports Hall of Fame in 1955, making her the first and only non-human CSHF inductee until 1960, when she was joined by Canadian Hydroplane Champion Miss Supertest III. That same year another honour was bestowed upon the famous sailing ship when a new Canadian National Railways passenger-vehicle ferry for the inaugural Yarmouth-Bar Harbor service was launched as the M/V Bluenose. Bluenose, under full sail, is portrayed on the 1929 Canadian Bluenose postage stamp as well as on two other stamps issued in 1982 and 1999 and also appears on the current Nova Scotia licence plate. 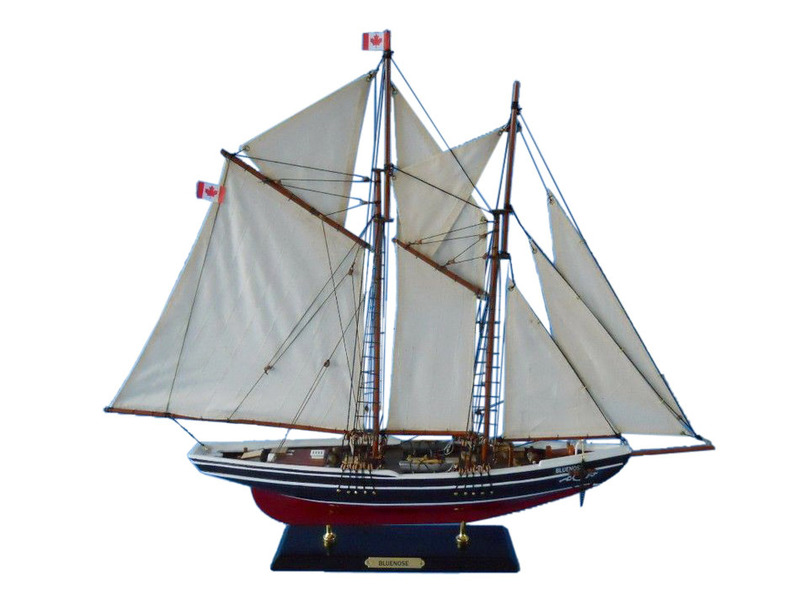 The depiction of a generic schooner on the Canadian dime has for years been commonly known as the Bluenose. In 2002, the government of Canada declared the depiction on the dime to be the Bluenose. Canadian folk singer Stan Rogers honours both ships in his song Bluenose, found on his albums Turnaround, released in 1978, and Home In Halifax, released posthumously in 1994. A sailing ship called 'Bluenose' appears in the 1990s children's television program, Theodore Tugboat. In the series TUGS, there is a character called Bluenose that, although it is not a schooner, may be named after the schooner. The ship is also prominently mentioned in the Circle-Vision 360° film "O Canada!" in the Canadian pavilion at Epcot, in Walt Disney World Florida. In traditions associated with Sailors and Marines crossing the Arctic Circle line, there was a "raucous and rowdy" initiation presided over by those who had crossed the line before, known as "Order of the Blue Nose". The eldest Sailor was called King Neptune, and the next eldest was his assistant who was called Davy Jones. Some form of hazing would be carried out by the senior crewmen. "Blue Nose" Crossing of the Arctic Circle (66-32 North latitude). See also "Arctic Circle", "Order of the Blue Nose" and "Northern Domain of the Polar Bear." Marq de Villiers. Witch in the Wind:The True Story of the Legendary Bluenose. Toronto: Thomas Allen, 2007. Keith McLaren. A Race for Real Sailors: The Bluenose and the International Fishermen's Race 1920 - 1938. Vancouver: Douglas & McIntyre, 2006.